1Vendor Landscape: Revenue Management Systems Info-Tech Research Group Info-Tech Research Group, Inc. Is a global leader in providing IT research and advice. 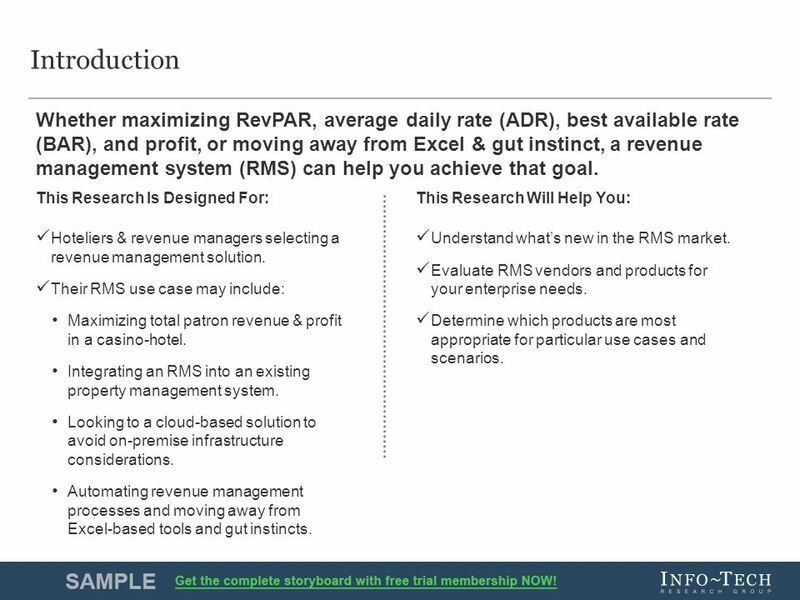 2 2Vendor Landscape: Revenue Management Systems Info-Tech Research Group Whether maximizing RevPAR, average daily rate (ADR), best available rate (BAR), and profit, or moving away from Excel & gut instinct, a revenue management system (RMS) can help you achieve that goal. Introduction Hoteliers & revenue managers selecting a revenue management solution. Their RMS use case may include: Maximizing total patron revenue & profit in a casino-hotel. Integrating an RMS into an existing property management system. Looking to a cloud-based solution to avoid on-premise infrastructure considerations. Automating revenue management processes and moving away from Excel-based tools and gut instincts. This Research Is Designed For:This Research Will Help You: Understand what’s new in the RMS market. Evaluate RMS vendors and products for your enterprise needs. 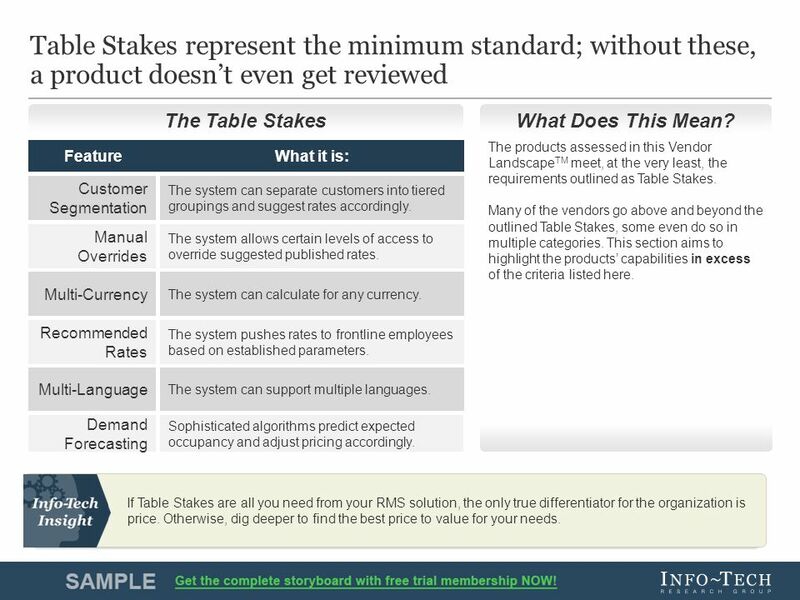 Determine which products are most appropriate for particular use cases and scenarios. 3 3Vendor Landscape: Revenue Management Systems Info-Tech Research Group Market Overview The first analytics-driven pricing and marketing strategies date back to the 1970s when airlines began monitoring seat sales and adjusting their pricing to eliminate as many empty seats on a flight as possible in a practice termed “yield management.” The principles behind yield management – overbooking, rate flexibility, and forecasting – showed great potential for the hotel industry as well, leading to the Marriott International adopting the practice of modern revenue management in the early 1990s. 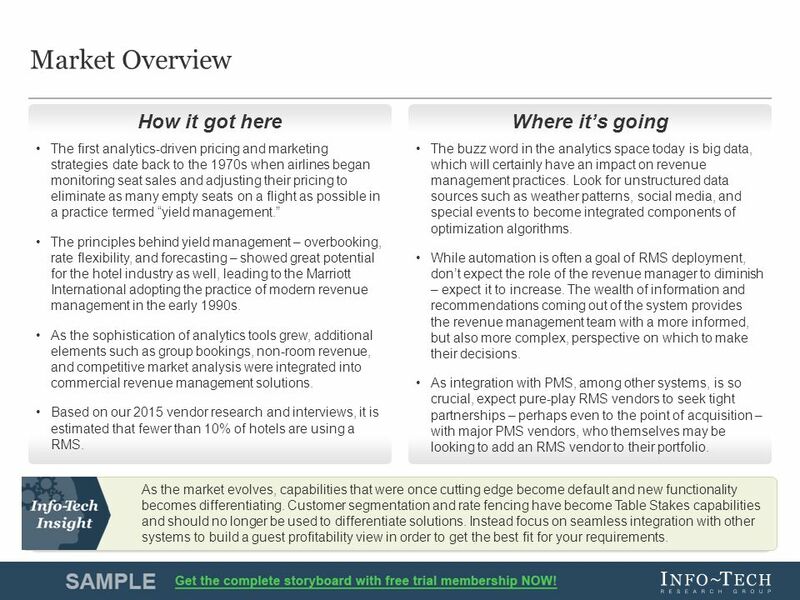 As the sophistication of analytics tools grew, additional elements such as group bookings, non-room revenue, and competitive market analysis were integrated into commercial revenue management solutions. Based on our 2015 vendor research and interviews, it is estimated that fewer than 10% of hotels are using a RMS. The buzz word in the analytics space today is big data, which will certainly have an impact on revenue management practices. Look for unstructured data sources such as weather patterns, social media, and special events to become integrated components of optimization algorithms. While automation is often a goal of RMS deployment, don’t expect the role of the revenue manager to diminish – expect it to increase. The wealth of information and recommendations coming out of the system provides the revenue management team with a more informed, but also more complex, perspective on which to make their decisions. As integration with PMS, among other systems, is so crucial, expect pure-play RMS vendors to seek tight partnerships – perhaps even to the point of acquisition – with major PMS vendors, who themselves may be looking to add an RMS vendor to their portfolio. How it got here Where it’s going As the market evolves, capabilities that were once cutting edge become default and new functionality becomes differentiating. Customer segmentation and rate fencing have become Table Stakes capabilities and should no longer be used to differentiate solutions. Instead focus on seamless integration with other systems to build a guest profitability view in order to get the best fit for your requirements. 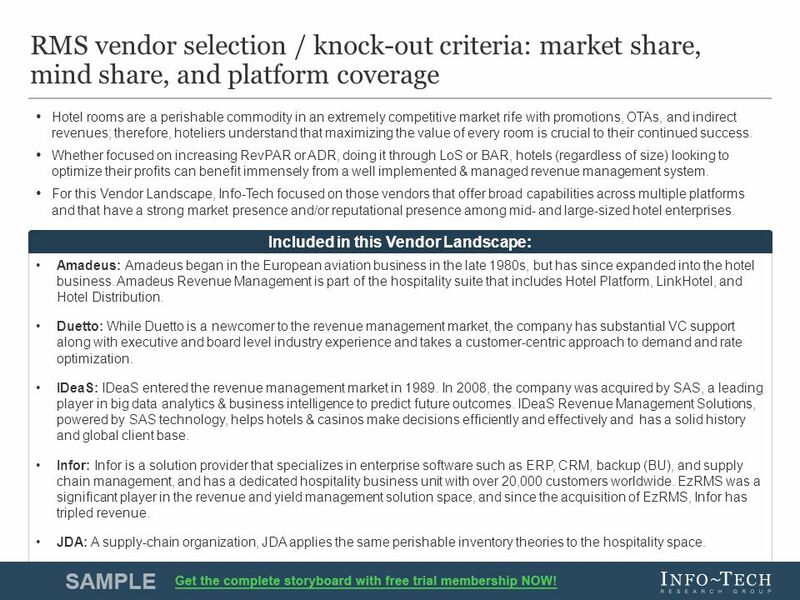 4 4Vendor Landscape: Revenue Management Systems Info-Tech Research Group RMS vendor selection / knock-out criteria: market share, mind share, and platform coverage Amadeus: Amadeus began in the European aviation business in the late 1980s, but has since expanded into the hotel business. Amadeus Revenue Management is part of the hospitality suite that includes Hotel Platform, LinkHotel, and Hotel Distribution. Duetto: While Duetto is a newcomer to the revenue management market, the company has substantial VC support along with executive and board level industry experience and takes a customer-centric approach to demand and rate optimization. IDeaS: IDeaS entered the revenue management market in 1989. In 2008, the company was acquired by SAS, a leading player in big data analytics & business intelligence to predict future outcomes. IDeaS Revenue Management Solutions, powered by SAS technology, helps hotels & casinos make decisions efficiently and effectively and has a solid history and global client base. Infor: Infor is a solution provider that specializes in enterprise software such as ERP, CRM, backup (BU), and supply chain management, and has a dedicated hospitality business unit with over 20,000 customers worldwide. EzRMS was a significant player in the revenue and yield management solution space, and since the acquisition of EzRMS, Infor has tripled revenue. JDA: A supply-chain organization, JDA applies the same perishable inventory theories to the hospitality space. 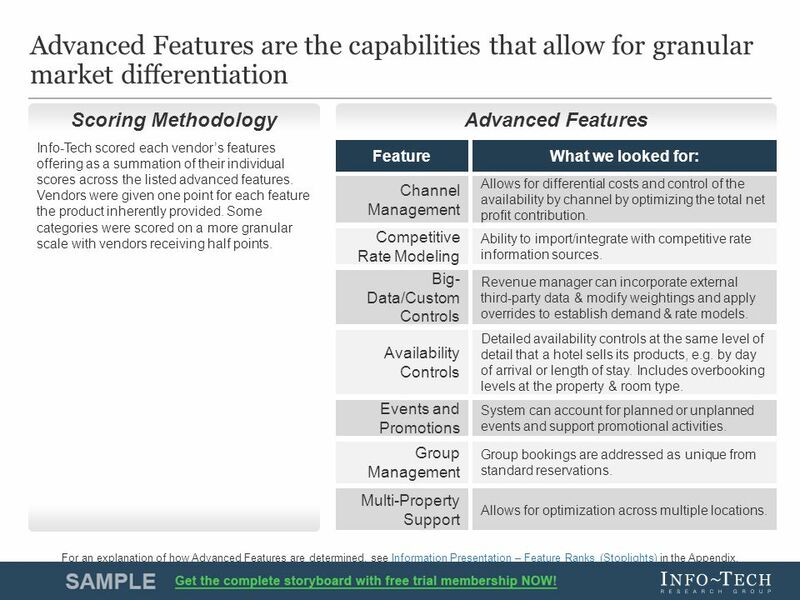 Included in this Vendor Landscape: Hotel rooms are a perishable commodity in an extremely competitive market rife with promotions, OTAs, and indirect revenues; therefore, hoteliers understand that maximizing the value of every room is crucial to their continued success. Whether focused on increasing RevPAR or ADR, doing it through LoS or BAR, hotels (regardless of size) looking to optimize their profits can benefit immensely from a well implemented & managed revenue management system. 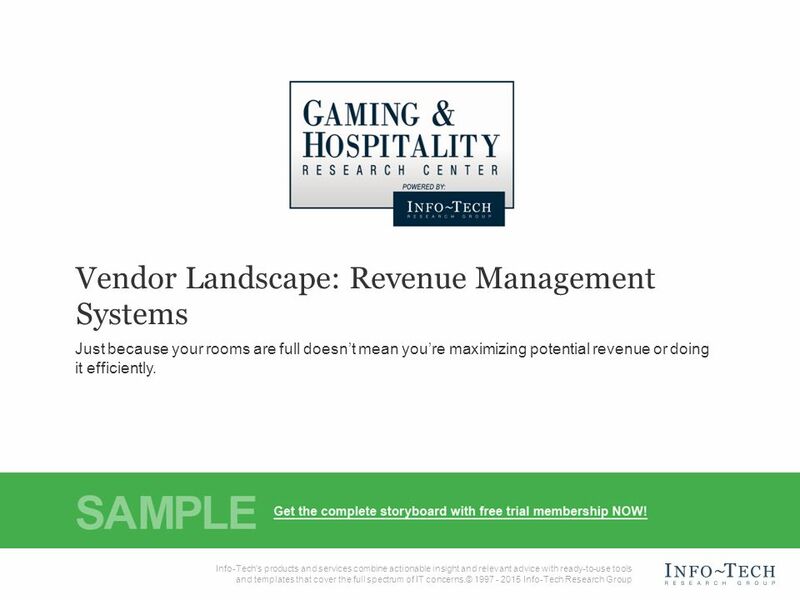 For this Vendor Landscape, Info-Tech focused on those vendors that offer broad capabilities across multiple platforms and that have a strong market presence and/or reputational presence among mid- and large-sized hotel enterprises. 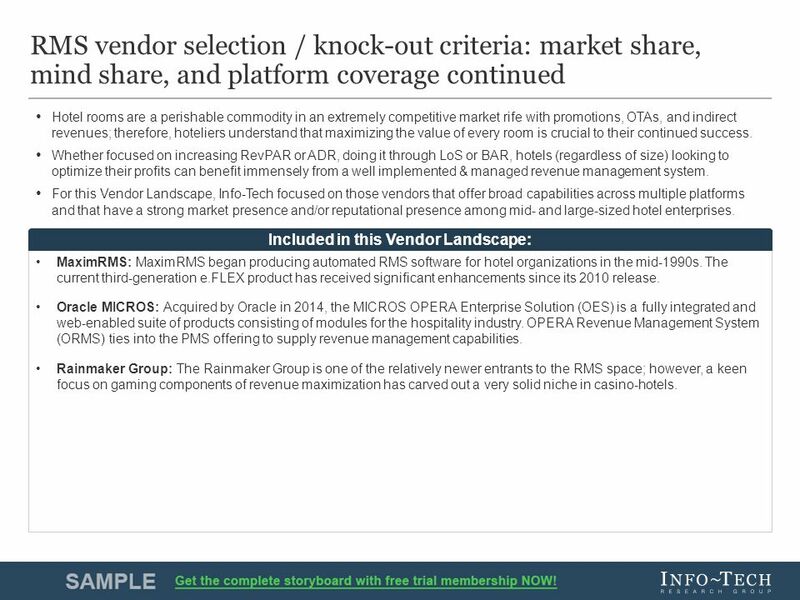 5 5Vendor Landscape: Revenue Management Systems Info-Tech Research Group RMS vendor selection / knock-out criteria: market share, mind share, and platform coverage continued MaximRMS: MaximRMS began producing automated RMS software for hotel organizations in the mid-1990s. The current third-generation e.FLEX product has received significant enhancements since its 2010 release. Oracle MICROS: Acquired by Oracle in 2014, the MICROS OPERA Enterprise Solution (OES) is a fully integrated and web-enabled suite of products consisting of modules for the hospitality industry. OPERA Revenue Management System (ORMS) ties into the PMS offering to supply revenue management capabilities. Rainmaker Group: The Rainmaker Group is one of the relatively newer entrants to the RMS space; however, a keen focus on gaming components of revenue maximization has carved out a very solid niche in casino-hotels. Included in this Vendor Landscape: Hotel rooms are a perishable commodity in an extremely competitive market rife with promotions, OTAs, and indirect revenues; therefore, hoteliers understand that maximizing the value of every room is crucial to their continued success. Whether focused on increasing RevPAR or ADR, doing it through LoS or BAR, hotels (regardless of size) looking to optimize their profits can benefit immensely from a well implemented & managed revenue management system. For this Vendor Landscape, Info-Tech focused on those vendors that offer broad capabilities across multiple platforms and that have a strong market presence and/or reputational presence among mid- and large-sized hotel enterprises. 10 10Vendor Landscape: Revenue Management Systems Info-Tech Research Group Vendor Landscape Methodology: Overview Info-Tech’s Vendor Landscapes are research materials that review a particular IT market space, evaluating the strengths and abilities of both the products available in that space, as well as the vendors of those products. These materials are created by a team of dedicated analysts operating under the direction of a senior subject matter expert over a period of six weeks. 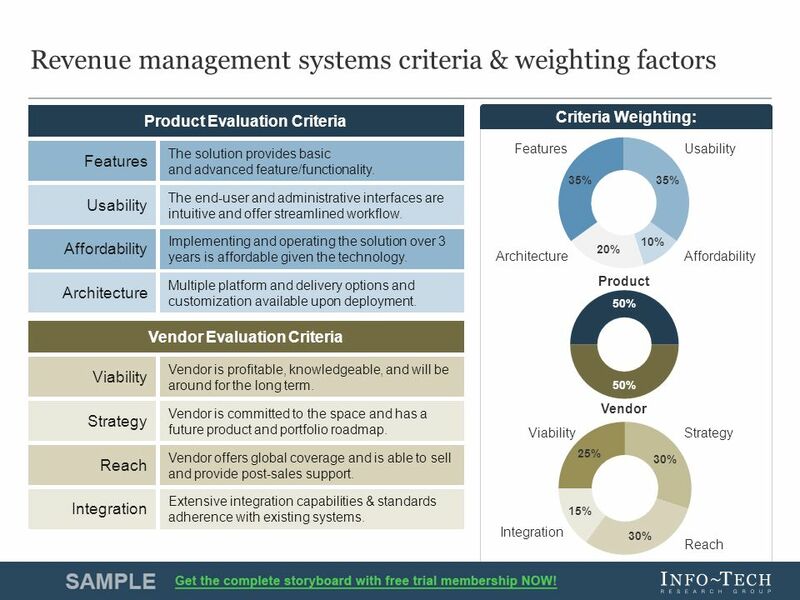 Evaluations weigh selected vendors and their products (collectively “solutions”) on the following eight criteria to determine overall standing: Features: The presence of advanced and market-differentiating capabilities. Usability: The intuitiveness, power, and integrated nature of administrative consoles and client software components. Integration: The degree of integration with the vendor’s other tools Architecture: The degree of flexibility of deployment, and breadth of platform applicability. Viability: The stability of the company as measured by its history in the market, the size of its client base, and its financial performance. Strategy: The commitment to both the market-space, as well as to the various sized clients (small, mid-sized, and enterprise clients). Reach: The ability of the vendor to support its products on a global scale. Partnership: The measure of the size of the vendor’s channel partner program, as well as any channel strengthening strategies. Evaluated solutions are plotted on a standard two by two matrix: Champions: Both the product and the vendor receive scores that are above the average score for the evaluated group. Innovators: The product receives a score that is above the average score for the evaluated group, but the vendor receives a score that is below the average score for the evaluated group. Market Pillars: The product receives a score that is below the average score for the evaluated group, but the vendor receives a score that is above the average score for the evaluated group. Emerging Players: Both the product and the vendor receive scores that are below the average score for the evaluated group. 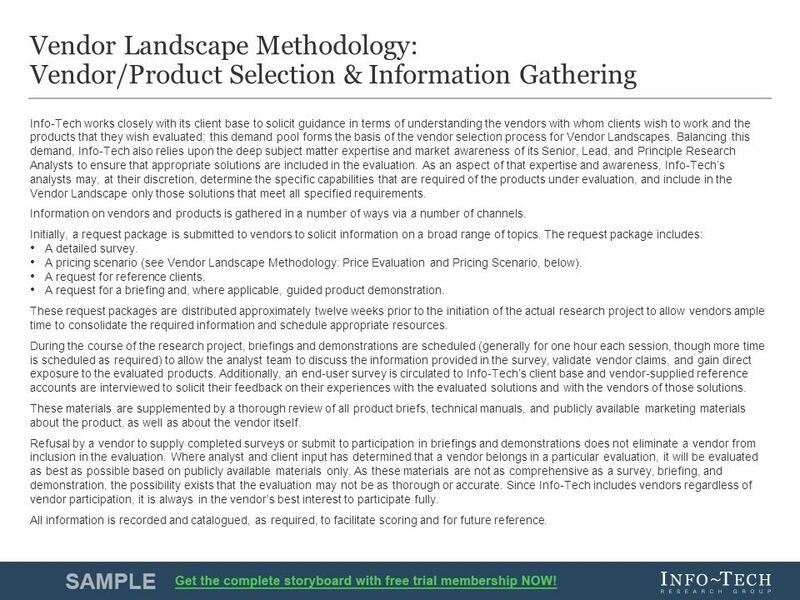 Info-Tech’s Vendor Landscapes are researched and produced according to a strictly adhered to process that includes the following steps: Vendor/product selection Information gathering Vendor/product scoring Information presentation Fact checking Publication This document outlines how each of these steps is conducted. 11 11Vendor Landscape: Revenue Management Systems Info-Tech Research Group Vendor Landscape Methodology: Vendor/Product Selection & Information Gathering Info-Tech works closely with its client base to solicit guidance in terms of understanding the vendors with whom clients wish to work and the products that they wish evaluated; this demand pool forms the basis of the vendor selection process for Vendor Landscapes. Balancing this demand, Info-Tech also relies upon the deep subject matter expertise and market awareness of its Senior, Lead, and Principle Research Analysts to ensure that appropriate solutions are included in the evaluation. As an aspect of that expertise and awareness, Info-Tech’s analysts may, at their discretion, determine the specific capabilities that are required of the products under evaluation, and include in the Vendor Landscape only those solutions that meet all specified requirements. Information on vendors and products is gathered in a number of ways via a number of channels. Initially, a request package is submitted to vendors to solicit information on a broad range of topics. The request package includes: A detailed survey. 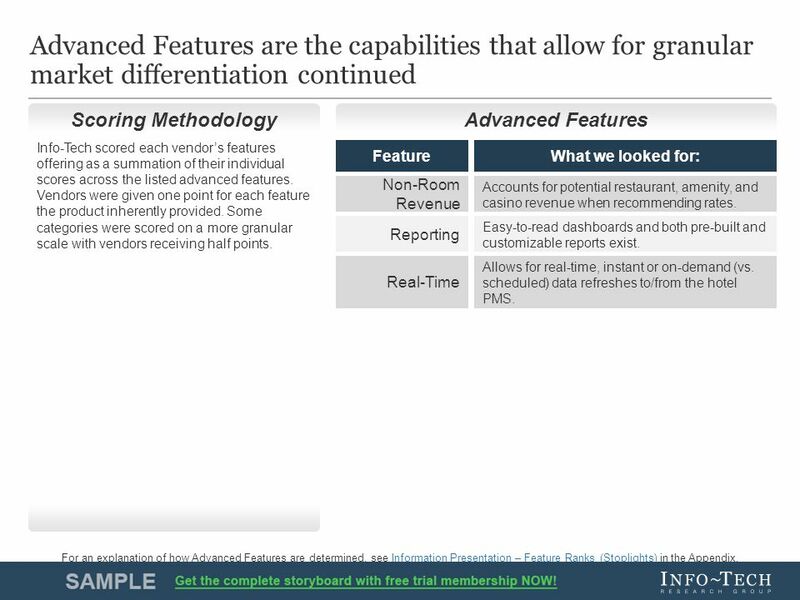 A pricing scenario (see Vendor Landscape Methodology: Price Evaluation and Pricing Scenario, below). A request for reference clients. A request for a briefing and, where applicable, guided product demonstration. These request packages are distributed approximately twelve weeks prior to the initiation of the actual research project to allow vendors ample time to consolidate the required information and schedule appropriate resources. During the course of the research project, briefings and demonstrations are scheduled (generally for one hour each session, though more time is scheduled as required) to allow the analyst team to discuss the information provided in the survey, validate vendor claims, and gain direct exposure to the evaluated products. Additionally, an end-user survey is circulated to Info-Tech’s client base and vendor-supplied reference accounts are interviewed to solicit their feedback on their experiences with the evaluated solutions and with the vendors of those solutions. These materials are supplemented by a thorough review of all product briefs, technical manuals, and publicly available marketing materials about the product, as well as about the vendor itself. Refusal by a vendor to supply completed surveys or submit to participation in briefings and demonstrations does not eliminate a vendor from inclusion in the evaluation. Where analyst and client input has determined that a vendor belongs in a particular evaluation, it will be evaluated as best as possible based on publicly available materials only. As these materials are not as comprehensive as a survey, briefing, and demonstration, the possibility exists that the evaluation may not be as thorough or accurate. Since Info-Tech includes vendors regardless of vendor participation, it is always in the vendor’s best interest to participate fully. All information is recorded and catalogued, as required, to facilitate scoring and for future reference. 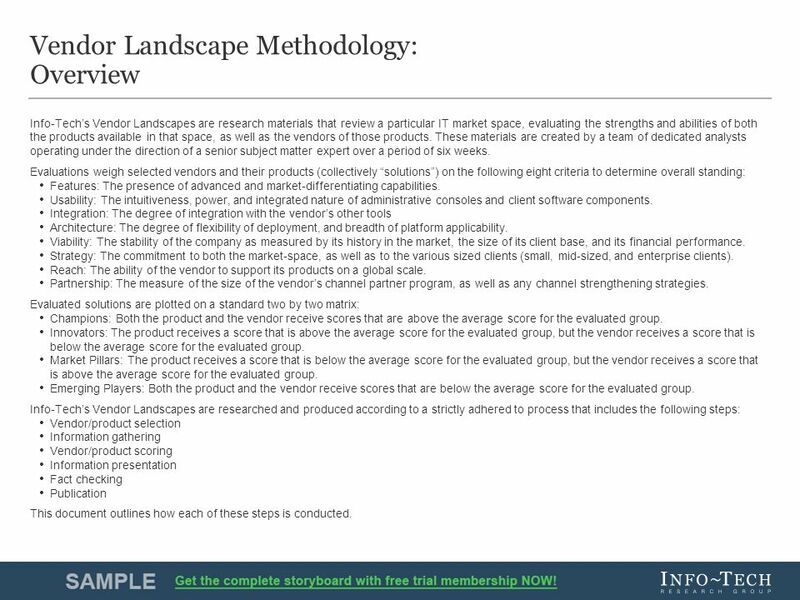 Download ppt "1Vendor Landscape: Revenue Management Systems Info-Tech Research Group Info-Tech Research Group, Inc. Is a global leader in providing IT research and advice." Sage CRM awarded industry analyst awards. Sage CRM has been highly rated by recent industry analysts and awarded both a champion award and innovation award. 1Info-Tech Research Group Vendor Landscape: [Technology] Info-Tech Research Group, Inc. Is a global leader in providing IT research and advice. Info-Tech’s. Impact Research 1 Enabling Decision Making Through Business Intelligence: Preview of Report. 1Info-Tech Research Group Vendor Landscape: Application Integration Middleware Info-Tech Research Group, Inc. Is a global leader in providing IT research. 1Info-Tech Research Group Vendor Landscape: Canadian Co-location/ Managed Services Sort through disguised differentiation to get back to an apples-to-apples. 1Info-Tech Research Group Vendor Landscape: Web Experience Management Info-Tech Research Group, Inc. Is a global leader in providing IT research and advice. 1Info-Tech Research Group Vendor Landscape: eGRC Solutions Info-Tech Research Group, Inc. Is a global leader in providing IT research and advice. Info-Tech’s. 1Info-Tech Research Group Vendor Landscape: Innovation Management Solutions Info-Tech Research Group, Inc. Is a global leader in providing IT research. Info-Tech Research Group1 Info-Tech Research Group, Inc. Is a global leader in providing IT research and advice. Info-Tech’s products and services combine. 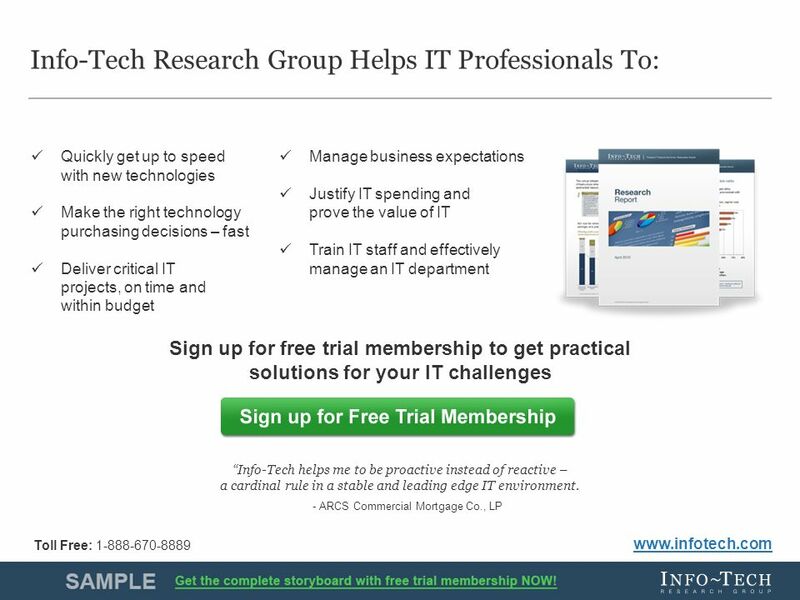 Practical IT Research that Drives Measurable Results Manage Help Desk Staffing 1Info-Tech Research Group. 1 1Vendor Landscape: Cloud File Sharing Info-Tech Research Group Info-Tech Research Group, Inc. Is a global leader in providing IT research and advice. 1Info-Tech Research Group Vendor Landscape: Collaboration Platforms Info-Tech Research Group, Inc. Is a global leader in providing IT research and advice. 1Info-Tech Research Group Vendor Landscape: NGFW Info-Tech Research Group, Inc. Is a global leader in providing IT research and advice. Info-Tech’s products. 1Info-Tech Research Group Vendor Landscape: IT Asset Management Enterprise Info-Tech Research Group, Inc. Is a global leader in providing IT research and. 1Info-Tech Research Group Vendor Landscape: Business Process Management (BPM) Suites Info-Tech Research Group, Inc. Is a global leader in providing IT. Info-Tech Research Group1 1 Info-Tech Research Group, Inc. is a global leader in providing IT research and advice. Info-Tech’s products and services combine. Info-Tech Research Group1 Headline / Subhead Vertical Spacing Info-Tech Research Group, Inc. Is a global leader in providing IT research and advice. Info-Tech’s. 1Info-Tech Research Group Vendor Landscape: European Co-location/Managed Services Take the time to thoroughly evaluate the European market before making. 1Info-Tech Research Group Vendor Landscape: Cloud Infrastructure- as-a-Service Options are proliferating as Cloud Infrastructure-as-a-Service provides.